Take a mixing bowl and add raw rice, par boiled rice, black gram, pigeon peas, bengal gram and pressed rice and wash well. Add sufficient water and soak for 3 hours. Using a mixer grinder or a wet grinder, grind the soaked ingredients, using the soaked water to a smooth batter. Add rock salt while grinding the batter so that it mixes well. Here 150ml of soaked water was required to grind the batter. Transfer the batter to a deep bowl and cover it and keep it aside to ferment for 12 hours. Wash potatoes well. Take a pressure pan and add 200ml water into it. Place a steamer basket in the pressure pan and place the washed potatoes in it. Cover the pressure pan and cook on high heat. After first whistle, lower flame and cook for 10 minutes and switch off the stove. Allow the pressure cooker to cool and then remove the cooked potatoes. Peel the cooked potatoes and mash them. Wash and grate carrot using large holed grater. Peel and slice onion and keep aside. Wash and finely chop ginger and green chilies. Cut cashew nuts into small pieces. Heat a pan and add oil and heat oil. When oil is hot add black gram and fry stirring till they start changing color. Then add cashew nut pieces and mustard seeds and fry till mustard seeds stop spluttering---by that time cashew pieces turn golden brown. Then add cumin seeds and fry till they splutter. Then add ginger and green chili pieces and fry them till chilies turn crisp. Then add sliced onion and fry stirring till they turn translucent. Then add grated carrot and fry for a minute. Add turmeric powder and mix and add mashed potatoes, salt and mix well. Add water, mix and cook covered for 2 to 3 minutes on low flame. Transfer the prepared curry to a bowl. Break chilies into small pieces. Peel onion and garlic and chop them to small pieces. Heat a pan and add oil and add bengal gram and red chili pieces and fry stirring for 1 1/2minutes. Add onion pieces and garlic pieces and fry stirring for 1 1/2minutes. Transfer the fried ingredients into a mixie jar and cool for a while. 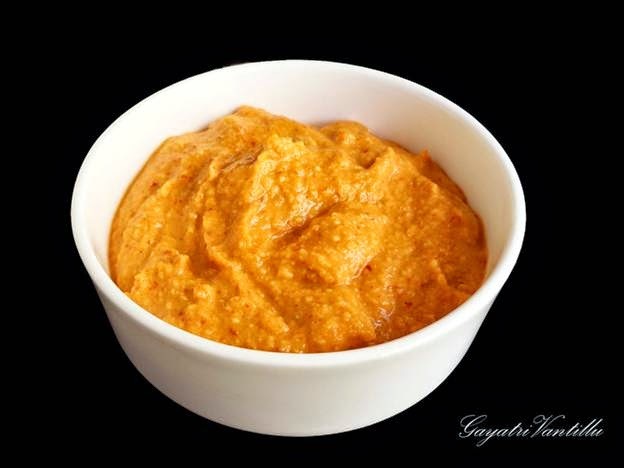 Adding sufficient water, grind the chutney to a smooth or slightly coarse paste. Transfer the prepared chutney to a bowl. Add sufficient water (10ml) to batter and mix well. Heat an iron griddle---here I have used a cast iron griddle. After seasoning the griddle with oil and heating it well, add a ladleful of batter and spread on the griddle with the back of the ladle. 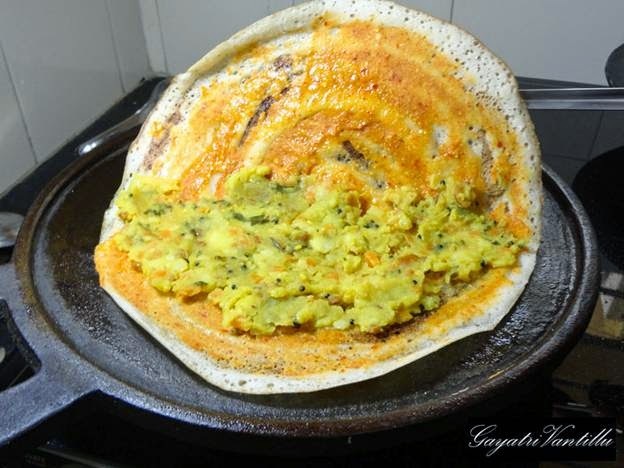 When the batter dries up a bit add some red chutney in the centre of dosa. 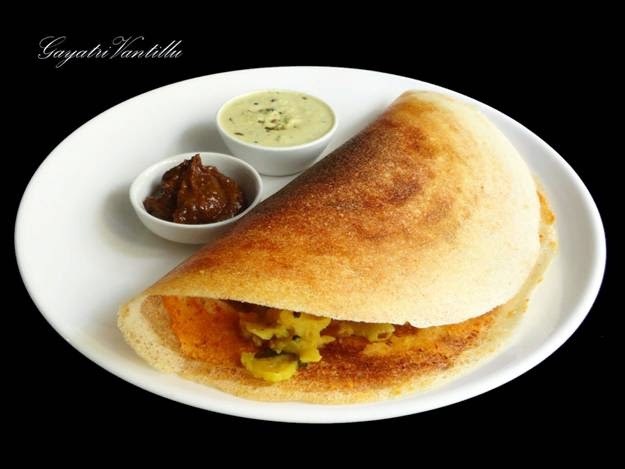 Spread the chutney with the flat ladle evenly on the entire dosa. 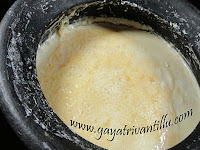 Add some butter on the dosa---here I have used homemade butter. 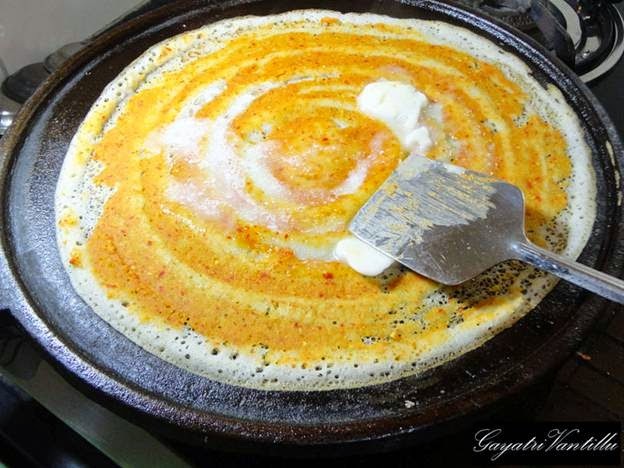 Spread butter evenly on the dosa with the flat ladle. 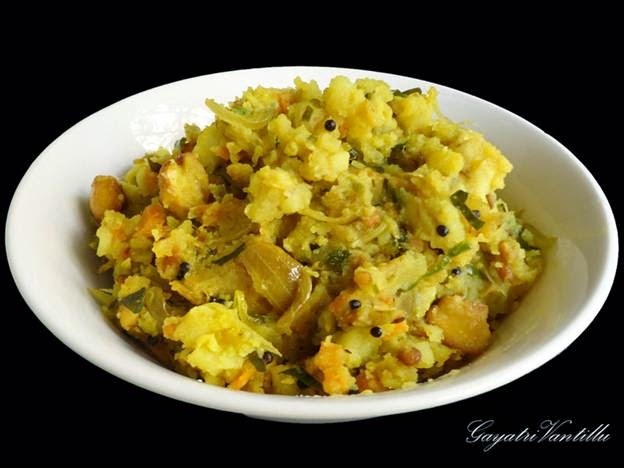 Spread with a spoon sufficient potato curry on half the portion of the dosa. By this time the dosa is well roasted. 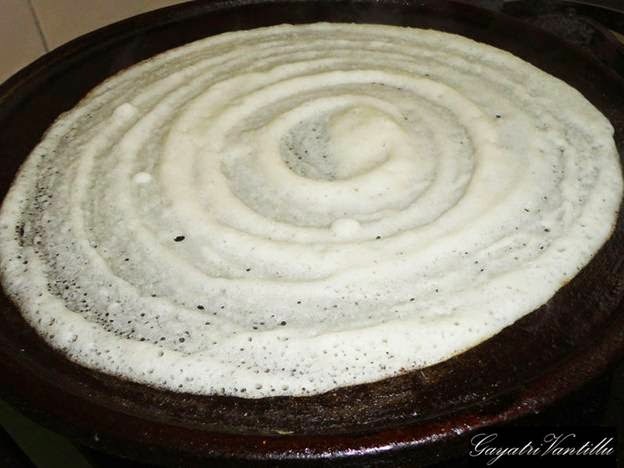 Carefully remove the dosa and transfer to a serving plate. 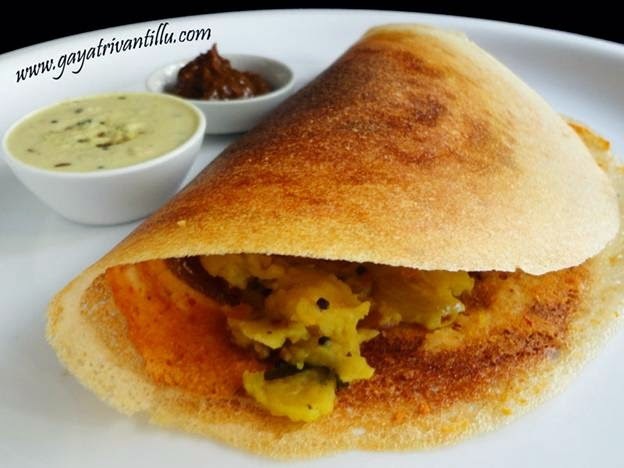 Serve hot Mysore Masala Dosa with coconut chutney and ginger chutney. The pigeon peas in the batter mixture makes the batter sour very soon---so just after fermenting keep the batter in refrigerator till use. Try to finish off the batter the same day as it turns sour by next day. Use rock salt if adding while grinding the batter. If adding iodized table salt it may be added after fermenting as the free flowing component in the salt prevents the fermentation in the batter. Use soaked water to grind the batter for easy fermentation. 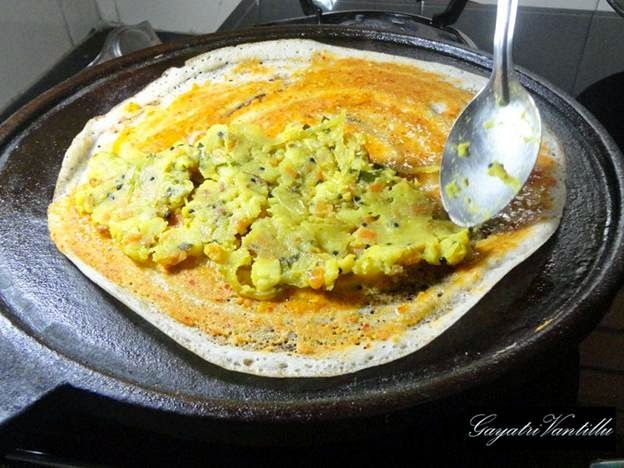 Pigeon peas and bengal gram gives nice red color to the mysore masala dosa. 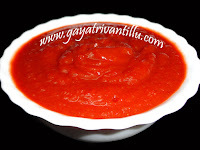 Using kashmiri red chilies gives a bright red color to the chutney. First heat the griddle on low flame for 15 minutes. Add few drops of oil and smear on the griddle using a cloth or paper napkin. Sprinkle some water in the centre of the griddle to cool little bit before spreading the batter. Just before spreading the batter add few drops of oil and smear on the griddle using paper napkin. Reduce flame to low and then add a ladleful of batter and spread it quickly using the back of the ladle. Now increase the flame to medium and wait till the batter on the surface dries up slightly. Then add chutney and quickly spread on the dosa. 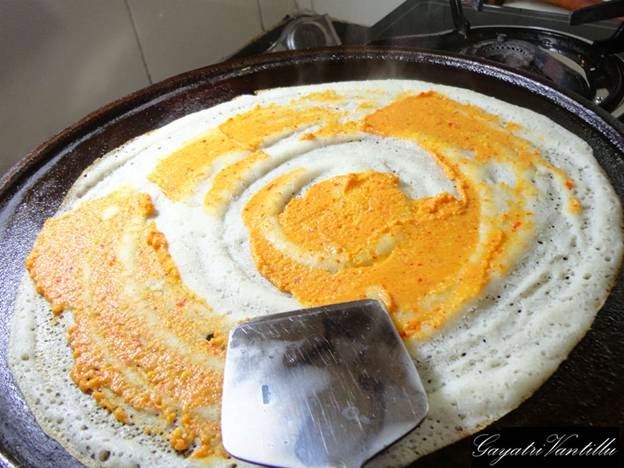 Then add butter and quickly spread on the dosa. 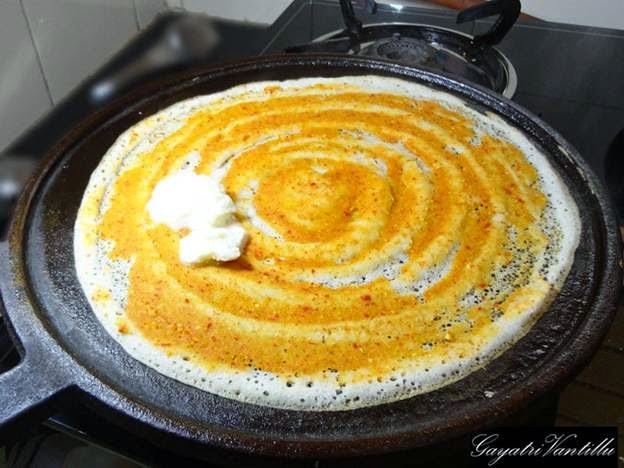 Then spread curry on the dosa and fold it and serve immediately. The spread chutney gets roasted slightly after we add butter on the dosa---this gives that extra taste to the mysore masala dosa. As such this dosa has some chutney on it and also curry in it. So there is no necessity of serving it with other chutneys. But generally it is served with coconut chutney and sambar in restaurants. 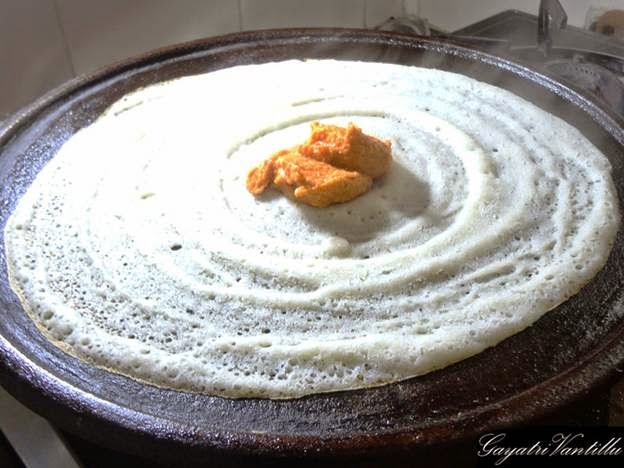 As per your preference you may serve this tasty mysore masala dosa.